The Greater Lowell area of Massachusetts (approx. pop. 300,000) includes nine separate communities. Lowell, the economic and cultural focal point of the region, is the fourth largest city in Massachusetts and has a long history as a “gateway community”. The region is home to significant Cambodian, Laotian and Hispanic populations who fish and swim in the Merrimack River. The river flows through some of most densely populated and polluted areas of New Hampshire before flowing through the heart of Lowell. In the Greater Lowell region, it is impaired for pathogens, nutrients, priority organics and metals. Stormwater contributes an estimated 60% of the pollutants responsible for the river’s impaired water quality. Nevertheless, the Merrimac River remains a popular location for boating and other recreation and is the drinking water source of Lowell and the surrounding communities. The project’s goal was to effectively communicate the impacts of stormwater pollution and present some solutions, paying special attention to the particular needs of the various low-income, non-English speaking communities present in the Greater Lowell region. The project team conducted extensive community outreach through in-person meetings and community events to engage potential partners and raise awareness of the impacts of stormwater pollution on local water quality. Team members then developed various stormwater messages and, using focus groups and informal feedback, tested their effectiveness with audiences that included representatives of the local Hispanic and Cambodian communities. Using this feedback, the team developed visuals, messages, and graphics tailored for each population for a select number of stormwater best management practices. Behaviors targeted for individual action included encouraging pet waste clean-up and tree planting, and discouraging storm drain dumping and polluting car washing practices. The team also promoted activities such as low impact development practices to local developers, municipal staff and local officials. Outreach materials were used in a series of trainings and workshops with identified partners and key audiences throughout the Greater Lowell region. The team also developed a Train-the-Trainer Program to expand the reach of this education effort, and wrote a “How-To” guide to help other communities develop stormwater education programs tailored to their particular needs. This project engaged a significant number of community partners to conduct stormwater outreach to their constituencies, including representatives of the business community (e.g. Greater Lowell Chamber of Commerce and Merrimack Valley Economic Development Council), cultural organizations (e.g. Cambodian Mutual Assistance Assn. and Southeast Asian Environmental Justice Partnership), recreational groups (e.g. Essex Rowing Club and UMass Lowell Rowing Program) and government agencies (e.g. National Park Service – Lowell and the Mass. Dept. of Environmental Protection). Held six focus groups to understand community issues, concerns and connections related to stormwater. Reached 128 community members through 11 workshops and educational sessions and engaged 13 community partner organizations to share stormwater information with their constituencies. 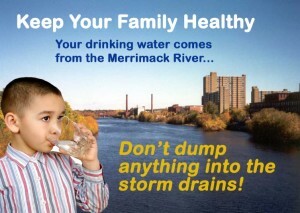 Developed tailored messages to reach Lowell’s diverse audiences and effectively communicate how water quality can be restored through stormwater management. Materials are available in 3 languages – English, Spanish and Khmer – and target priority best management practices. Created the Northern Middlesex Stormwater Collaborative (NMSC), a forum for regional collaboration on stormwater and water quality issues that has grown to include 13 communities. Developed a Train-the-Trainer Program and trained stakeholder organizations throughout the region, including cultural and conservation organizations, recreational clubs and business associations. Created a “How-To”’ guide to help other communities develop their own tailored stormwater education programs. Identify what people care about by reaching out to neighborhood groups, recreational users and others that care about rivers. Project staff worked with local English as Second Language classes, bilingual newspapers, the YMCA and the local Chamber of Commerce. Staff also attended local ethnic festivals, neighborhood meetings and other community events. Focus your campaign on issues where stormwater problems and community priorities intersect. Test your communications approaches, messages and visuals. Use formal or informal focus groups to present materials, solicit feedback and make modifications accordingly. Be on the lookout for cultural differences and be respectful of them in your messaging. Visit nmstormwater.org to download outreach materials created through this project, including tested stormwater messages, stormwater presentations for various audiences (e.g. students and ESL classes), a stormwater education program “How To” manual and “train-the-trainer” documents. Water Words That Work LLC helps non-profit organizations, government agencies, and charitable foundations develop modern and professional communication programs. Visit them at waterwordsthatwork.com to learn about their “Environmental Message Method”, including “water words that work” (and that don’t!). The Northern Middlesex Council of Governments (NMCOG) was formed in 1963 and is one of thirteen Regional Planning Agencies (RPA) in the Commonwealth of Massachusetts. NMCOG supports the communities of the Greater Lowell region across a range of land use planning objectives, including environmental protection. NMCOG assists with the design, facilitation and implementation of programs which further the interests of the entire region. The Merrimack River Watershed Council is a nonprofit organization with 35+ years’ experience working with municipalities, community groups, businesses and local residents to improve the water quality of the Merrimack River and its tributaries.